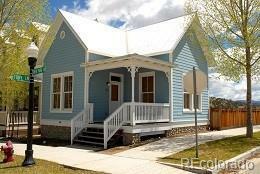 Located on a corner lot about a block from the river, this cottage style home represents a unique opportunity to own South Main property at an uncharacteristically low price. Although the floorplan is compact, 1101 River Park's well designed, high quality exterior fits in seamlessly with the many $600k+ properties which comprise a majority of the neighborhood. Vaulted ceilings throughout give this home a larger feel than the SF would suggest. An open kitchen/living room area and solid yet simple finishes make it ideal for empty nester's looking to simplify, first time home buyers, short term rentals or weekend getaways to experience all that BV has to offer. And its location just up the street from Midland Stop coffee shop and the Surf Hotel couldn't be more convenient. A front porch and fenced backyard provide plenty of outdoor space to enjoy grilling or catching up with neighbors. The backyard is also large enough for a one car garage with a studio apartment above.